Son of the multi Championship winning CME Tulaco Centurion, out of Meon Valley Bon Bon, daughter of Supreme Champion Meon Valley Bonita. Bonami has matured into a very handsome macho, with excellent substance and presence. His fleece is super-dense, fine and very soft handling, with a very well organised, high frequency crimp style which continues into his legs and neck. The winner of 13 broad ribbons to date and the recent winner of Champion Fawn Male at 2014 Alpaca Showtime Judged by Peter Kennedy from Australia. and he was Champion Adult Male at the 2013 BAS Nationals, above many superb white males. 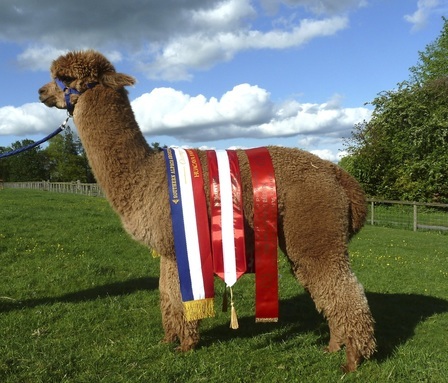 Bonami was also awarded Champion Fawn Male and Best of British at the Heart of England Show 2013 and Reserve Champion Fawn Male at the 2013 British Alpaca Futurity, plus many other broad ribbons in previous years. We would consider selling this male because we have too many females who are too closely related. We will be offering stud services to him until he is sold. A proven stud, with delightful progeny.